Bird feeders are part of many backyards during the winter months. We enjoy the activity around the feeder, both by the birds themselves and the additional wildlife that feed on the leftovers knocked to the ground. We can attract specific birds by choosing an appropriate feeder and feed. One of our favorite ones seems to be the thistle feeder since it will attract a number of different finches into our yard. 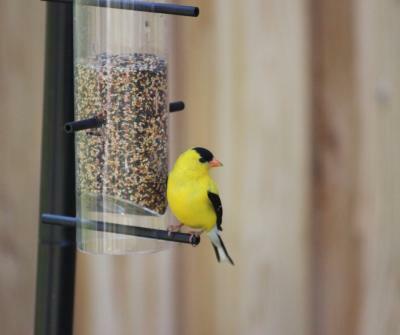 Since thistle seed can be expensive, these specific feeders do not allow the larger birds to feed. We likely have all seen these feeders; they are usually a clear plastic cylinder with several small perches near holes where the finches can feed. Even these feeders can be more selective if you want. If the perches are horizontal, then sparrows will be able to eat too. If there are no perches, this limits the seed to finches who can "perch" on other parts of the feeder. General bird feeders accommodate just about any bird that visits the backyard. Some of these bird feeders have weighted perches that allow the smaller birds access while the weight of the larger birds will cause a door to close over the seed. This can conserve a lot of seed and stretch your resources. One big concern may be all the wasted seed down on the ground. This is typical if we use a mix of seed to fill the feeder without any mechanisms to limit bird species. Each bird throws out seed looking for their favorite. If you do not mind that, then there is plenty of seed on the ground for squirrels, rabbits and other smaller creatures that need to eat all winter. Some birds like mourning doves and juncos will feed on the ground as well. Another way to handle the waste is to feed using more than one feeder and in each one, a specific seed. Examples would be sunflower seed for cardinals, nuthatches and chickadees. Millet will attract sparrows and juncos. If your interest is with bigger birds like woodpeckers, then supply suet as well. If you only have room for one feeder and want to feed a variety of birds, chose one that has suet feeders on the ends, has a weighted perch to manage the seed supply and use a mix of seed. It is very important that once you start to feed the birds, you continue throughout the entire winter season, as birds will come to rely on your feeder daily. If you have already been feeding birds for years, then you also know that a source of open water also is appreciated. Lastly, the trough area where the seed is available will clog up with seed debris and spent seed parts over time. When the feeder is near empty, and before you fill it back up, take in down and clean out the feeder area allowing many more birds to feed a the same time.